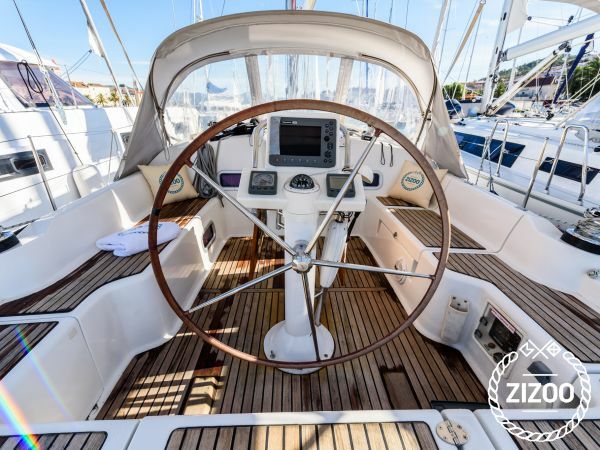 Book this Oceanis 37 in Trogir and set sail along the coast of Dalmatia aboard one of Beneteau’s finest sailing yachts. The Oceanis line remains one of the most popular charter yachts worldwide. The 37 is a great mid-range model that is ideal for sailing groups of up to 8 persons. This particular model features 3 cabins, including a gorgeous master suite. The interior is bright and spacious providing plenty of seating and elegant overhead lighting. Set sail on this Oceanis 37 and discover Dalmatia’s most inspiring places like the city of Split and the islands of Brac and Hvar, which you can visit using our island hopping sailing route. You can also learn more about the Oceanis line in our magazine.